Weavers throughout Guatemala weave the indigenous cotton, along with Retroglo®, to make our Social Fabric™. The floor loom is made by Francisco Tcoc and his associates in a village north of Sololá, the capital city of the Mayan province around Lake Atitlán. The looms use no electricity. A simple pedal action sends the shuttle back and forth. Backstrap weaving is the most primitive type of weaving and is still in-practice among indigenous peoples around the world. This method of weaving requires wooden dowels, a saddle, and a beam. A woman can care for her children and home while earning a decent living. Variations in tension and the natural punctuation of household chores that call a weaver away from the saddle, create a skin-like texture in the fabric. 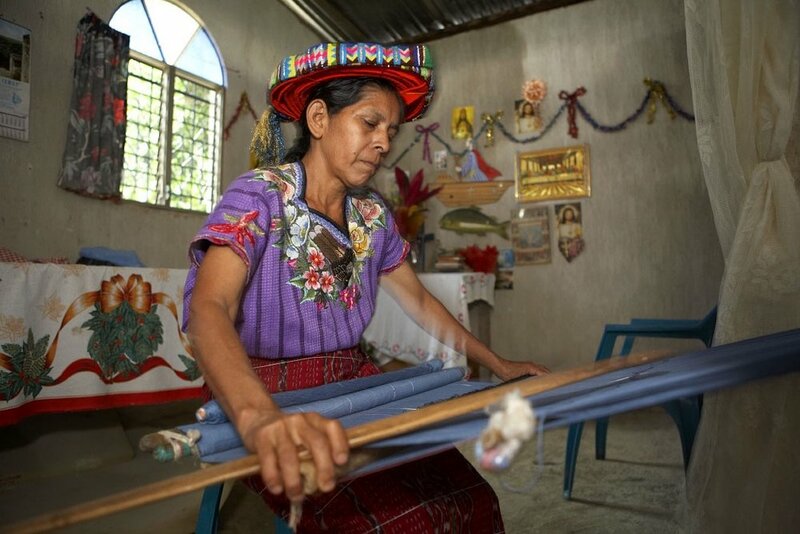 20 Mayan weavers produce backstrap loom fabric in Chicacao, Guatemala in their own homes. It takes a weaver approximately 8-15 days to produce enough fabric for a garment using the backstrap weaving method. The following image shows the difference between the floorloom and backstrap fabrics. The backstrap (top) has a thicker nap and is slightly more irregular than the floorloom (bottom). Besides having visual appeal, the reflection has many levels of meaning. Practically, it prevents the Mayan weavers from the threat of cheap imitations and encourages the wearer to engage in a safe, active lifestyle. On a higher level, the manmade fiber juxtaposed against a handmade cloth indicates the relationship between God and man.